Quick announcement: Pathfinders Group Coaching is now open for enrollment. Designed for people who want to identify the type of work they’re meant to do in the world and start actually doing it, Pathfinders of one of my most cost effective programs. Find out more and get the details here. First of all, happy new year! I hope your transition to 2019 was a good one. Mine, to be honest, was a little rough. Between holiday preparations, surprises at work, the inevitable glitches of a house renovation, dentists, car maintenance, back pain, and an increasingly intense campaign I’m involved in to protect my city’s trees, I was feeling slightly overwhelmed. Lying awake in bed one night, I was so wound up thinking about all the things I had to do that I couldn’t sleep. I know by now that such worrying isn’t helpful, so I naturally responded by obsessively creating a list of things I ought to do to calm down, forcing myself to do them, then criticizing myself when I realized that my compulsive problem-solving was making me more uptight and miserable, not less. Only when the tension got so intense that I could barely stand to be in my own skin did I get desperate enough to admit that I had a problem and no idea how to solve it. And then, of course, as soon as I did, my misery immediately disappeared. There’s something magical that happens when we release ourselves from the expectation that we ought to know how to solve all our problems. It opens us up to find freedom, acceptance, and—paradoxically—the answers to our dilemmas. When we think that we should know something, our minds are so filled with thoughts, worries, and doubts that there’s no space to notice the solutions that are right in front of us. Only when we give up on knowing are we free to see the clues, ideas, and resources of which we previously weren’t aware. I talk to a lot of people who are disappointed or even depressed about their work. They can’t manage to stay satisfied with a job that may be well-paying but is ultimately unsatisfying, ill-fitting, or even agonizing. And yet because they have no idea what would be better, they give up and keep going back to a job that they know isn’t right for them day after day, month after month, and year after year. We’re often told that you have to know where you’re going if you’re going to get there. While that’s true at times, it never is in the beginning. In fact, not knowing your way is a critical first step to discovering it. 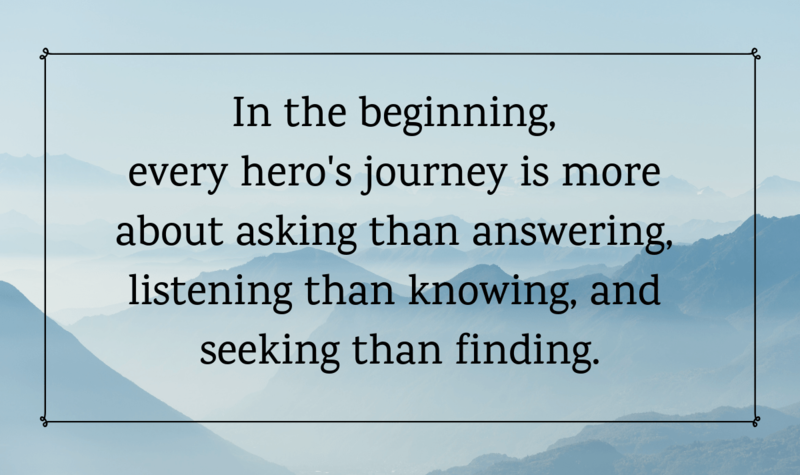 In the beginning, every hero’s journey is more about asking than answering, listening than knowing, and seeking than finding. Curiosity is far more useful in the first few steps than confidence. You might also sit in a quiet place and get curious as to what not knowing feels like. Admit that you’re clueless and then notice what you feel in your belly and chest. If your heart starts racing and your stomach tightens up, that’s not the feeling of not knowing; that’s the feeling of thinking you should know when you don’t. Repeat the phrase above, focusing on the second part, and try again. You might find that not knowing isn’t as uncomfortable as we tend to think it is. Wobbly, sure, but also exhilarating; far from empty, it’s actually filled with possibility. In my experience, the answers always come in time. But only to those humble (or desperate) enough to admit that they don’t have them. Sorry to hear about your rocky start to 2019. Best wishes for rapid improvement. I know this post isn’t just for me, but could have been. I guess it’s some comfort to know I’m not alone in…well, not knowing. And thanks as always for the great perspective!